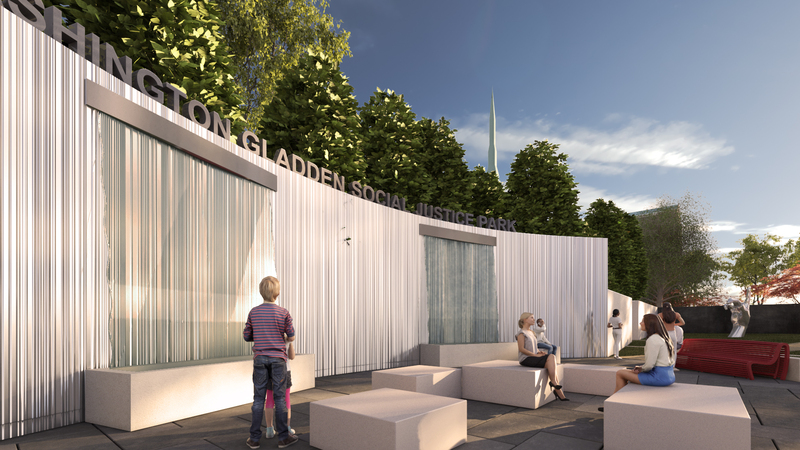 On April 2, 2017, the congregation gave its approval to move forward with plans for a social justice park at Cleveland and Broad. At this time, the main focus is to finalize the park’s design. Construction is to begin this summer. There is a website link in this report that will display several renderings of the latest park design. Please review the illustrations and forward your thoughts and questions about the park’s design to the members of the Park Planning Group and members of council. It should be noted that the screen or backdrop for the park will not be as tall as reflected in the illustrations. Its maximum height at terrace level will be 8’ while it will be no higher than 4’ from the parking lot level. Also, the screen will be more tapered along the sides. The screen may be stainless steel, granite, an ivy mesh, or a combination of some of these elements. The final design is still a work in progress. 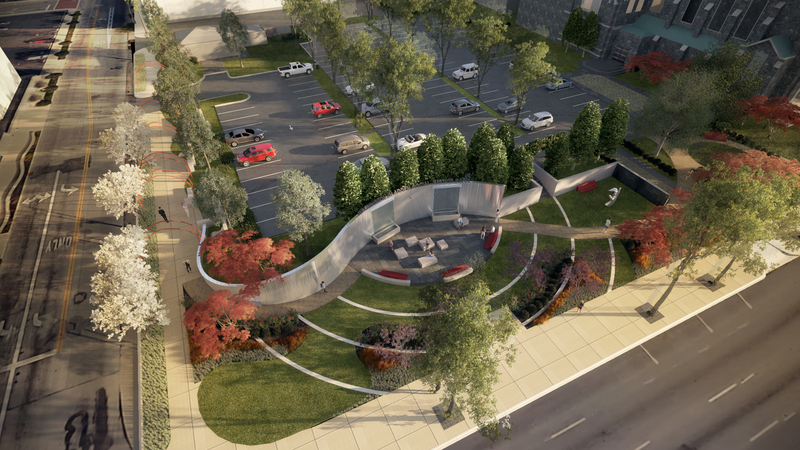 On May 23, 2017, the Downtown Commission conducted a conceptual review of the latest design for the park. Commission members provided strong support for the project with very positive reviews. Comments included: “super”, “terrific”, and “love it.” This is not the norm at commission meetings where many developers face tough questions and significant advice from the commission members. One commissioner left the meeting while it was in progress to tell us how important this project is for the community and that he wants to know how his family can help with the project. After the meeting, another commissioner, a major downtown developer, met us and commented that he couldn’t believe that the church was doing the park project and what a gift it will be for the entire Columbus community. The current plan is to return to the Downtown Commission for approval of the final design on June 27, 2017. This schedule will allow for breaking ground later this summer and for a grand opening by next summer (2018). In the meantime, church representatives will be meeting with the leadership of the Columbus Foundation. We will discuss the scope of the park project and seek its support in advance of a community fundraising campaign. The park project already has received a $20,000 grant from the foundation. Current committed resources are sufficient to build the basic features of the park. 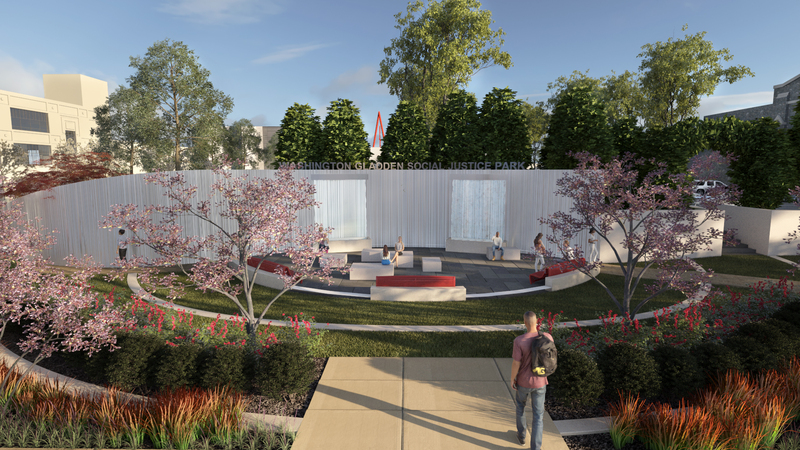 The fundraising campaign will focus on developing support for permanent art installations, a possible activity center, and endowments for affiliated park programs. Because church members made significant gifts to purchase the west lot, the fundraising will take place with the greater Columbus community. The City of Columbus has approved a capital improvement budget that will fund the Creative Campus proposal. This project will improve the streetscape on three sides of the church’s property. This will mean new sidewalks, street lighting, and landscaping on 9th St., Gay St., Cleveland Ave., and Washington Ave. 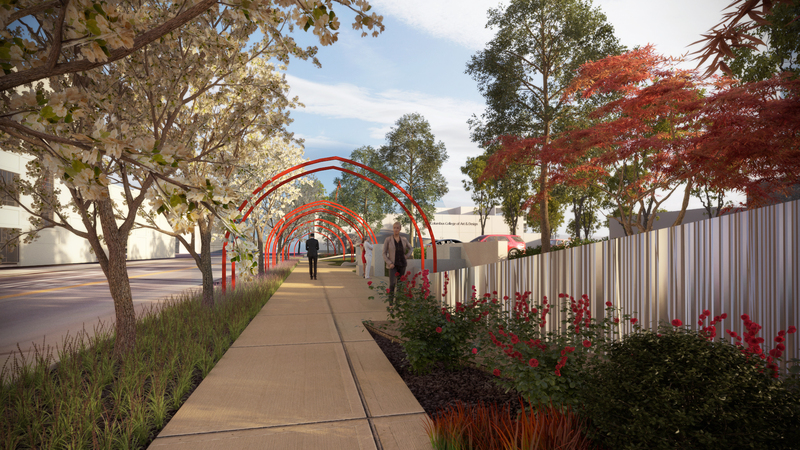 This includes a new sidewalk and landscaping along Cleveland Ave. adjoining the proposed park. The City also will bury utility lines near the park and elsewhere for the four-block campus project that will extend from Cleveland Ave. to Washington Ave. and from Broad St. to Long St. This is a $9 million investment in our immediate neighborhood. Construction will begin later this year with plans for completion by the end of 2018.